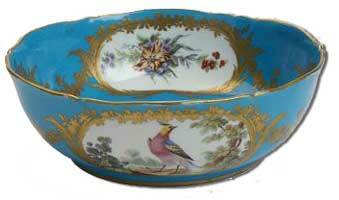 A quick look at a few good examples of Sevres porcelain in our Sevres Porcelain Gallery. 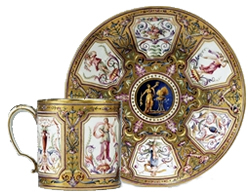 The Wallace Collection holds the finest museum collection of Antique Sevres Porcelain in the world. Both collections were mostly put together in the nineteenth century. Largely as a result of the French Revolution when so many great works of art came on the market. Saving them for future generations became a high priority for those that appreciate fine art and beauty. Painted with Raphaelesque panels of female figures, urns and baskets of flowers in canted cartouches on a gold ground reserved with arabesques of scrolling foliage and cornucopiae issuing flowers. Sevres Marks: c1787 Gilt Crowned Interlaced ‘L’ Marks enclosing date letter KK to cup. Painters Mark j.w. 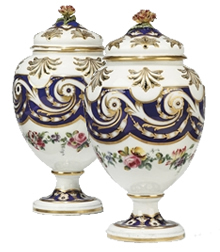 Moulded with a castillated band reserved with white and gilt rosettes, scrolling foliage and husk ornament on a bleu Fallot ground . The shoulder and domed cover pierced with acanthus panels. 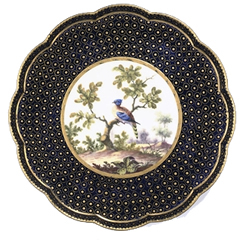 Dark blue ground painted with an exotic bird perched on a branch in a wooded landscape within a gilt roundel. Painters mark ‘IN’ for Aloncle. Within gilt cartouches on a bleu nouveau ground. Gily borders with bands of berried laurel leaves between gilt line and beaded ornament. Of circular scalloped form, with bleu royale ground, the interior with three oval panels framed and enjoined by gilt scrolling foliage, and painted with summer flowers on a white ground. The exterior with similar panels painted with exotic birds within a landscape setting. Sevres Marks: Underglaze brown mark, with date code ‘u’ for 1773 and with initials ‘L.G.’ for the decorator Le Grand and V.D. Tip! 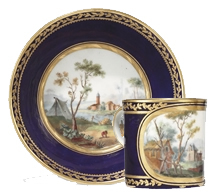 Always buy the best pieces of Sevres Porcelain you can afford. Try to make sure they are as near perfect as possible and you will never regret your investment.